Locals pack this cozy wood-fired pizza place in Encinitas. : Wade Hageman, formerly of Blanca, and his wife Kristi have created a neighborhood gem in Encinitas that mixes a San Francisco savvy vibe with a laid-back beach town energy. Expect to find Hageman himself at the wood-fired brick oven, carefully tending to the thin-crusted pizzas. Nibble on black-seed popcorn sprinkled with truffle salt and Parmigiano-Reggiano, or whipped goat cheese with Black Mission figs and pickled fennel on toast. Try the meatballs with rustic bread or the manchego and ricotta stuffed piquillo peppers, then order up a Caesar salad and piping hot pie like the Americana with fresh mozzarella, olives and artisan pepperoni. 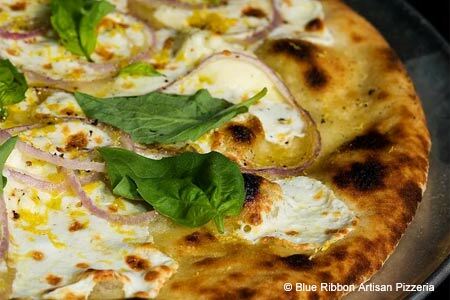 Organic and sustainable wines dominate the list, and compelling craft beers on tap make for a nice companion to the pizzas. For dessert, get the butterscotch pudding with sea salted caramel. Sister restaurant Blue Ribbon Rustic Kitchen is located at 530 University Ave, Hillcrest, 619-501-6795.